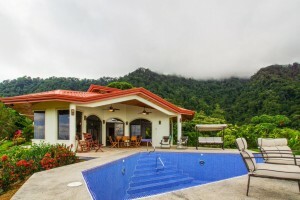 This is a spectacular ocean view house, perched on a hilltop with incredible 360 degree view.From the patio and pool is an expansive view across the valley of the Great Terraba River, the mangroves and the Pacific Ocean. This three-bedroom house offers you the best view you have ever seen. It is scenic 7 km drive up a well maintained gravel road at an elevation that provides cooler temperatures. This house is fully furnished and has a self-contained one bedroom guest villa with its own pool and amenities. This is an ideal house for a family and its guests. It would be an ideal rental property, either part or full time. Satellite TV and internet are in place. There are hikes, waterfalls, streams, rivers, long isolated beaches, a famous National Park and flowers, birds and animals galore. There is always a cooling breeze. You will find it a very pleasant place to relax and enjoy life at its best. Toucans and Parrots abound, and monkeys and pizotes often visit.